"Dr. Guida has seriously changed my life." "The best doctor ever! I made a great decision choosing Dr.Guida." "Can't say enough!!! Dr. Guida is the only doctor I would trust... He listens and does!" "Great Dr. and incredible staff"
"The best. Caring, compassionate, professional and unbelievably talented." "I am very impressed with Dr. Guida and his staff. Staff was polite and courteous"
"Dr Guida is patient focused and is intent on helping the patient any way he can." "Doctor Guida is incredible. He changed my life. " Dr. Robert A. Guida is a plastic and rhinoplasty surgeon serving patients in New York, NY. He is double board-certified by the American Board of Facial Plastic & Reconstructive Surgery and the American Board of Otolaryngology – Head & Neck Surgery. Dr. Guida has expertise in a variety of areas, including deviated septum surgery, rhinoplasty, facelift, eyelid surgery, laser resurfacing, sinus surgery, Botox, and otoplasty. He is an expert in Revision Rhinoplasty. Dr. Guida is one of very few U.S. surgeons that have an Image Guided Sinus Surgery Fusion machine in his office operating room. Dr. Guida attended the University of Steubenville in Ohio, where he earned a B.S. in Biology. He then earned his medical degree at Hahnemann University School of Medicine in Philadelphia, Pennsylvania. Dr. Guida completed an Internal Medicine residency at Lankanau Hospital in Philadelphia, Pennsylvania, a General Surgery residency at the Graduate Hospital of the University of Pennsylvania, and an Otolaryngology – Head and Neck Surgery residency at the New York Eye and Ear Infirmary in New York City. His fellowship training in Facial Plastic and Reconstructive Surgery took place at Oregon Health Sciences University. Call anytime to arrange an appointment with Dr. Guida. We are here to help! Please contact us by calling or e-mailing to learn how you can afford the procedures you need. We accept Carecredit and we will also advise you on what insurances may cover your procedures. Dr. Guida is board certified by both the American Board of Facial Plastic & Reconstructive Surgery and the American Board of Otolaryngology – Head & Neck Surgery.
" All my office visits/surgery appointments have been handled with the utmost, gentle care over the past twenty years. I would recommend Dr. Guida without hesitation." "My experience with Dr. Guida was amazing. From the moment I met him, I knew I wanted him to be my doctor." 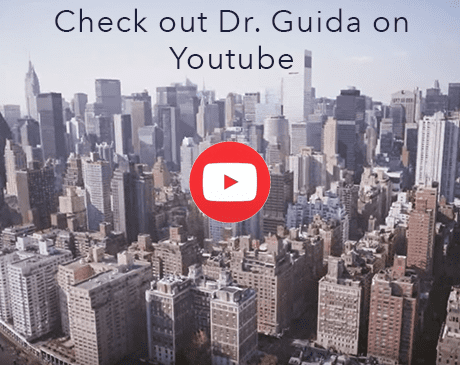 "Dr. Guida is a amazing surgeon in New York. I had functional and cosmetic work done to my nose; now I breathe so much better and my nose looks amazing and natural." "I had the best experience with Dr. Guida and his staff. They went above and beyond at every visit to make sure I was comfortable, and knew exactly what had to be done." "I had rhinoplasty/septoplasty and sinus surgery with Dr. Guida a few years ago. He was fantastic and I am very happy with my results."